You sick little loli lover. You should know that your people are dying. Bishonen master race. 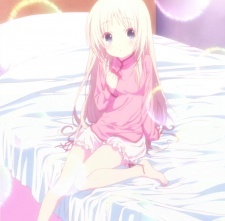 Yes i`m a lolicon, i want to POMF all the lolis. Yeah, it looks pretty interesting. Nice character designs! Key makes some great stuff. Now if only Rewrite was an anime.. I posted a review on Hoshizora in my blog entries if you hadn't noticed. It's spoiler free and worth a read. I have a walkthrough typed up on the same entry. I love that sig, Little Busters for life!